Catholics attending Mass in the Archdiocese of Chicago this weekend heard a recorded message from Cardinal Blase Cupich, updating them on a meeting to be held at the Vatican later this month that is expected to address clergy sexual abuse. The cardinal also apologized to the faithful who have been let down by some of its leaders. In September, following months of revelations about the ongoing sexual abuse crisis in the United States and elsewhere, the Vatican announced that Pope Francis had summoned the heads of bishops’ conferences in 130 countries to the Vatican for this month’s meeting. The pope has urged caution from those who hope the meeting will yield new policies and protocols related to preventing abuse. But expectations for the meeting have been heightened, in part by church officials who have long pushed for church leaders to take abuse more seriously. The pope has urged caution from those who hope the meeting will yield new policies and protocols related to preventing abuse. Archbishop Scicluna, along with Cardinal Cupich, Cardinal Oswald Gracias (who sits on the pope’s council of cardinal advisers) and Hans Zoller, S.J. (the president of the Centre for Child Protection at the Pontifical Gregorian University in Rome), were tasked by the pope with organizing the February summit. Father Reese, a former editor in chief of America, wrote that not enough time was allotted to planning the meeting, that it is too ambitious in scope and that a global meeting means it is unlikely that a common set of policies will be found. “Francis may pull it off, but I fear that when the meeting is over, it will only be seen as a small step forward in an effort that is going to take years,” Father Reese wrote. One example of a reform that S.N.A.P. hopes to see implemented are protocols for holding bishops accountable for covering up abuse that do not require the Vatican to investigate and take action, which critics say is too cumbersome a process. Mr. Hiner took issue with the participation in the meeting of Cardinal Daniel DiNardo, who in his role as head of the U.S. Conference of Catholic Bishops will be present in Rome. Cardinal DiNardo has faced allegations that he mishandled cases involving priests accused of abuse in the Archdiocese of Galveston-Houston, claims he denies. In his message to Chicago-area Catholics, Cardinal Cupich sought to assure Catholics that the meeting will be fruitful. Cardinal Cupich said that listening to victims and “taking measures to protect children and holding everyone accountable is the only response to make” to the sexual abuse crisis. “Getting this right is the priority,” he said. Catholic organizations throughout the United States have announced events related to the abuse summit, including a workshop on Feb. 6 at The Catholic University of America and a conference call hosted by the Catholic Common Ground Initiative on Feb. 18. 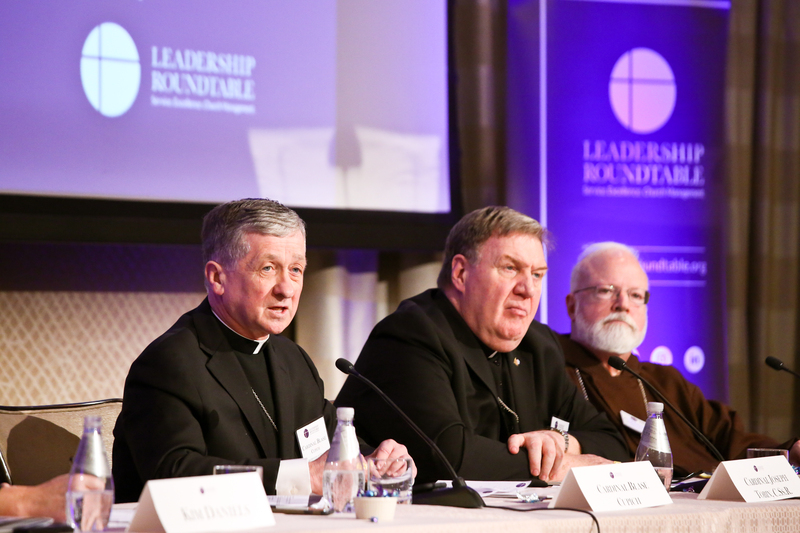 This past weekend, the Catholic reform group Leadership Roundtable, responding to requests from more than 50 dioceses for help in responding to the crisis, hosted more than 200 church leaders in Washington, D.C., including Cardinal Cupich and Father Zollner, along with Boston Cardinal Sean O’Malley and Newark Cardinal Joseph Tobin, as well as survivors of clergy sexual abuse. Attendees discussed “concrete measures that can be taken in the immediate-, mid- and long-term that lead toward necessary reform and recovery,” according to Kerry Robinson, the group’s global ambassador. A report discussing ideas about the root causes of the crisis and offering best practices in terms of accountability will be made public ahead of the Rome summit. A Leadership Roundtable report on best practices in terms of accountability will be made public ahead of the Rome summit. Ms. Robinson said the Rome meeting’s short duration may limit how much output is possible, but she added that she is encouraged by the pope’s commitment to continue meeting with victims and the global nature of the meeting. U.S. bishops were slated to vote on a series of proposals addressing sexual abuse during their November meeting in Baltimore, but those plans were scrapped after the Vatican asked them to wait until after the February meeting. It was later revealed that the proposed guidelines were not sent to the Vatican until just days before the vote was scheduled to take place, which church leaders in Rome felt was not enough time to vet the policies. “Combating the culture of abuse, the loss of credibility, the resulting bewilderment and confusion, and the discrediting of our mission urgently demands of us a renewed and decisive approach to resolving conflicts,” the pope wrote. But in recent days, the pope has tried to downplay high hopes about this month’s meeting. Speaking to reporters on Jan. 27 during an in-flight press conference on his way back to Rome from World Youth Day in Panama, Francis said, “I perceived inflated expectations. We have to deflate expectations to these points that I have made because the problem of abuse will continue; it is a human problem, a human problem [that is] everywhere.” Rather than create new protocols, the meeting will inform bishops about the scope of the sexual abuse crisis, the pope said, and inform bishops about how they are supposed to handle claims of abuse. Correction: The Leadership Roundtable meeting was held in Washington, D.C., Feb. 1-2, but not at Georgetown University as a previous version of this article stated. "It's a human problem..." Hah!. We're talking some real leadership here aren't we? Woe to you Scribes and...never mind...we're all sinners , just keep those donations coming in....And Jesus weeps. I cannot wait to read the defenders of, not the Church of course but the hierarchy, the modern day "...scribes and Pharisees, hypocrites." If this meeting fails to produce some clear cut solutions and implementation steps to counter the clericalism culture of protection, the Church will see many more Catholics leave and see few and less generous donations. .
expect nothing to come out of this meeting and you won't be disappointed. It only needs to deliver a one sentence communique= "all cases of abuse by Catholic clergy and/or cover up by Bishops must be reported immediately to civil authorities; failure to do so will result in immediate dismissal from office." Yes, I have few expectations of the trio sitting on the cover photo. Or of our Jesuit pope, who apparently has a solution to "accompany" all the world's problems except the ones in front of his VERY clerical nose. It's time for the laity to stand up and say: no more money until you clean house in your presbyterate from those "wounded healers" who can't keep their pants zipped, be it with minors or those who have attained the age of majority. The solution is in the money. What would happen if donations stopped for dioceses' and other 'religious ' communities who seem to focus on special ministries to adult homosexual communities and are weak-kneed when it comes to defending the unborn. The law will take care of the pedophiles but It's beginning to appear fornication is fairly rampant. I think more Catholics will want to investigate where their money is going. It's not fair to the hardworking' 'chumps' in the pews to be asked to support sordid lifestyles. There are still bishops and priests ( including some with homosexual orientations) who are doing the right thing, and I understand they're being persecuted by those who aren't. Catholics should never leave the Church....We should seek out God within the Church He gave us. After this coming exercise in smoke and mirrors, more people will simply walk away. John/Bev- The solution is with Pope Francis. It can't be solved overnight. Pope Benedict was unable to clean house either. It will take time, but he is the Vicar of Christ, chosen through the guidance of the Holy Spirit to lead us in these times. He is calling all of us, including the bishops and priests towards pastoral care of others. He is being met with great resistance, both by those all too comfortable with the status quo, and those who believe they are the true Catholics, and the Pope is wrong. How they reconcile that with the faith is beyond me, but nonetheless, we need to listen to what Pope Francis is saying, not to those who tell us what he means. The relentless attacks on our Pope, by the very people who, rightfully, criticize the non stop attacks on the President is extraordinary. Our shock and frustration by the behaviour of some of our priests and bishops in regard to sexual abuse and scandals, and by others in their lack of leadership in promoting the teachings of the Church has been deeply hurtful to Catholics and we have a right to call them out on it. They have hurt the innocent and the faithful. Our dear Pope, however, does not need to take the blame for their actions. He needs to do his best to clean house, and change hearts. I think he is doing just that. He is our moral leader, and he is leading by example. He is indeed, Christ's representative on Earth. We are blessed to have him. pretty much guarantees that no genuine justice we ever be an outcome of the system. achieved, it is too late to be of any use for those originally seeking justice. Is the real issue abuse? Or has that been mainly solved? Is the current issue what to do with those who protected abusers? That also is mainly in the past? How much is still going on? Is the main issue abuse of priestly vows? The Vatican seems to be hiding from this. I am astounded that the Pope is presenting this meeting as if it was the first time the Catholic Church has realized there was a sexual abuse problem. This problem has been widely recognized within the Church since the 1950's. Forgive me for believing the time for consultation and reflection has passed. Real leaders lead. Pope Francis start leading with action not reflection. interesting that O'Loughlin quotes Reese who has always downplayed the seriousness of the current crisis by asserting that since the Dallas charter in 2002 there have been hardly any new cases of clergy abuse--nevertheless, O'Loughlin in his article for this magazine about McCarrick on Feb. 12 notes that "Between 2004 and 2014, the Vatican laicized 848 priests because of sexual abuse." --how's that Mr Reese for a significant reduction in cases? My glass is half-full--how's yours?